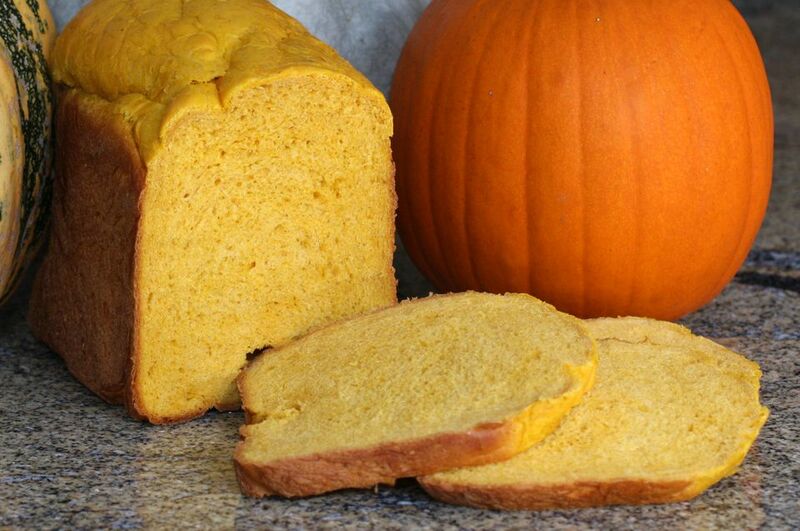 This savory pumpkin bread makes a delicious and colorful alternative to everyday white bread. It can make a great accompaniment to a warming bowl of chili or baked beans for an extra-special fall treat. For this recipe, you can either use your own mashed pumpkin or canned pumpkin puree. This could be a good use for your jack o'lantern if you're willing to put in the elbow grease to cook and mash it. See the recipe for ​​crock pot pumpkin puree if you want to go the route to start with a whole pumpkin. One cup of pumpkin, as included in this loaf of bread, has 171 percent of the daily value for vitamin A, plus it has vitamin C. You'll be adding good nutrition to your bread loaf. No spices are included in this recipe, so it's not a pumpkin pie spiced loaf. If you want to include some, that is your choice. You can enjoy your pumpkin bread sliced with butter or margarine or plain. In addition to enjoying it with chili, soup, or stews, try it toasted for breakfast. It should be delicious with apple butter and other spiced preserves. It doesn't have its own spices, so it will rely on that of the toppings. Add all of the ingredients according to your bread machine manufacturer's suggested order, with the default being the order listed in the ingredient list above. Use white bread setting, light crust. Alternatively, if you want to use the quick cycle on your bread machine, use 3 teaspoons of instant/rapid yeast and choose medium crust. Let your machine do its thing and enjoy the loaf when it is ready. Your bread machine will have a specific order for adding ingredients, which is necessary to keep the yeast away from the liquid and salt until the right moment. The general rule is to add the liquids first, then the dry ingredients, and finally, add the yeast last. This will keep the yeast from getting activated before the right time in the machine's cycle. Bread machines have bread cycle settings, and for this recipe, you should select white bread or Basic. Not every bread machine has a crust setting. Those that do will generally have Light, Medium, and Dark, with the default being medium. For this recipe, it's best to set it to Light.